Which Of These Parts Of A Chicken Help It Regulate Its Body Temperature? If You Want To Dig Through The Earth To Get To China, You'd Better Start In? 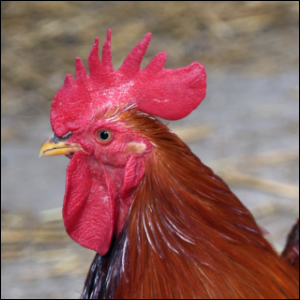 The leathery protrusion on the foreheads of chickens (most prominent on those of roosters) isn’t just a showy bit of sexual dimorphism that helps the strongest and healthiest roosters strut their stuff—although a bit of flashiness in the animal kingdom never hurts your odds at finding a mate. The comb offers a critical bit of assistance when it comes to temperature regulation. Chickens can’t sweat and, short of inefficient panting when under significant heat stress, they have no means of cooling themselves other than seeking somewhere cool and shady to hang out or using their combs as organic radiators (much like elephants and fennec foxes use their large ears to dissipate heat). Chicken combs are richly vascularized and have a direct connection to a large artery located in the base of the skull. The birds can adjust the amount of blood flow to the comb in order to expose more warm blood to the cool surrounding air and lower their body temperature.